Tsuba - signed "Naomichi + in" (H 06706.0), ca. 1800-50. In-mei is a gold inlay seal of the SEI kanji. Fuchi-Kashira - signed "Omori Teruhide + kao" (H 09566.0). See "Motifs - Waves" section for more details on this artist. Fuchi-Kashira - signed "Harunari + kao", Hirata Harunari (H 00844.0), Edo, born 1809, died June 2, 1840. Son of Narisuke, 8th master of the Hirata family school. Studied under the Yasuda gold carving family. He was a retainer of the Tokugawa Bakufu. Fuchi-Kashira - signed "Hogen Haruaki", Kono Haruaki (H 00760.0), born in Echigo in 1787, later resided in Edo, died December 26, 1857. At age 16, in 1802, went to study with Yanagawa Naoharu, who was a student of Yanagawa Naomitsu until 1801. After his studies he received from Naoharu the use of the HARU kanji in his art name, which he took at the age of 20, in 1807. After completing his studies he moved full time into his own studio in Tokyo. By about age 33 he was recognized by the Tokugawa Bakufu, and the court, where he was given middle court rank, chumu, and the title of Hokkyo. By about age 40 he was granted the title of Hogen. He is most often referred to as, Haruaki Hogen, which he often inscribed on his work. He had a vast number of students and followers. Horses Kozuka - signed "Echizennodaijo Minamoto Nagatsune + kao", Ichinomiya Nagatsune (H 06539.0), native of Echizen Province, also Kyoto, born 1722, died December 18, 1787. Student of Yasui Takanaga. 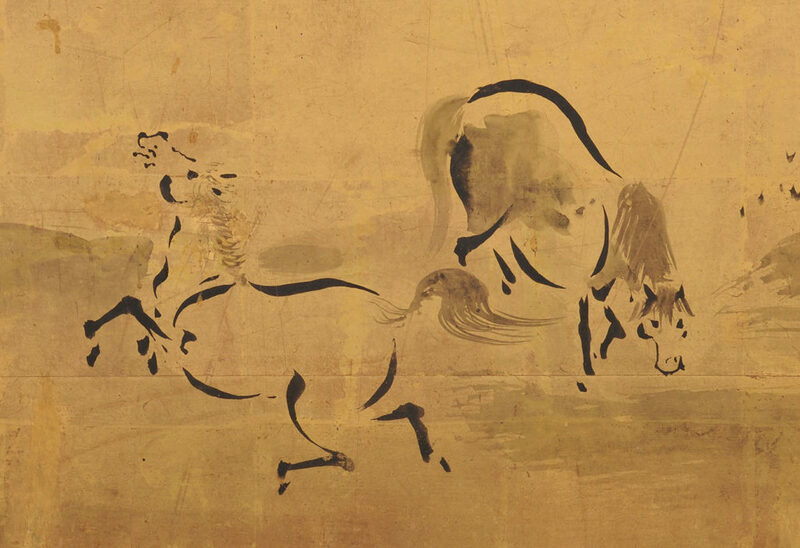 Studied painting under Ishida Yutei, 1721-86. In 1770 received the title of Echizennodaijo and later the title of Echizennokami with the use of the Minamoto name. He had a large number of students and followers.